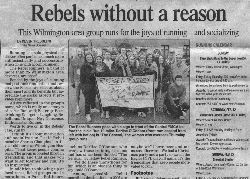 The Rebel Runners were featured in this article in the January 19, 2005 Wilmington News Journal. Kevin Tresolini, the staff reporter, successfully captured the dedicated, but fun-loving spirit of our group. The article appeared a few days after the 10 mile "Icicle Run" in downtown Wilmington. Running is a solo endeavor often performed much more enthusiastically and successfully when done with accompaniment. 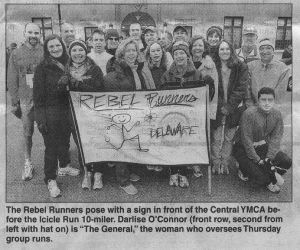 The Rebel Runners, a band of more than 25 Wilmington area devotees, are proof. Bonded by the joys of running and post-race rumination and revelry, the Rebels are serious about their sport and its benefits but appreciate the social aspects it provides even more. All are reflected in the group's name, which is really an acronym of sorts: Run well; Eat crap; Beer-drinking; Energetic; Laughing; Rebellious; Unique; No-; Nonsense; Enthusiastic; Runner. Words to live or, in the Rebels' case, run by. "I think it's about motivation and socialization," said Rebel member Sharon C, a 41-year-old nurse at Wilmington Hostpital. "That keeps people coming back. The group is bonded through friendship, and that makes you want to get together and run. It's an inspiration." In addition to showing up at local races, Rebel groups ran in marathons in Paris, Baltimore, Cape Cod, Washington, D.C., New York City, Philadelphia and Richmond, Va., last year. Earlier this month, a group went to the Rock N Roll Arizona Marathon and Half-Marathon in Phoenix, where activities also included shopping, eating and mountain climbing. Dan W, a 46-year-old psychologist, was one of nine Rebel Runners in the marathon. "We all went out together and six of us ran together for the majority of the race," he said. "That was very helpful to me. You're out there for a long time and that support is very important." The group now has its own Website - www.attractweb.com/rebels - in which members have chronicled some of their running experiences in the "Narratives" section. The Rebel Runners gather for group runs on Thursdays at Delcastle Recreation Area in Mill Creek between 5 and 6 p.m. Weekends they gather for longer jaunts from a club member's home, often followed by refreshments. It was those Thursday runs, originally organized by the Pike Creek Valley Running Club as half-marathon training sessions, that became the impetus for the Rebels. Most are PCVRC members, such as Darlise O, who oversaw those training sessions and has since been dubbed, "The General" by fellow Rebel Runners. "We do these marathons for fun, which is an obscene thing to say," she said. Among possible Rebel marathon destinations in 2005 are Rome, Alaska and Minnesota. "It's a very diverse group," The General said, "and we probably never would have run into each other if it wasn't for those Thursday night training sessions. Now we look forward to seeing each other so much. The group has really melded. We look forward to Thursdays, especially talking about where we might eat and drink afterward. Lori C, a 41-year-old medical technologist, had trained for three marathons with her roller-blading husband providing periodic company, she said. then she joined those Thursday sessions, and began to enjoy running much more because of the camaraderie. She has run five more marathons since. "It's 10 times better running with this group," she said. Her Rebel friendships helped Sharon stay involved in running, which she first tried less than two years ago in an effort to lose weight and get in shape for a soccer league. "That was 35 pounds ago," she said. "This is just a very social group, made up of every day, professional-type people. We'll get together before a run and have bagels and orange juice an dcoffee, maybe we'll have beer and mimosas afterward. We had a Christmas party and a party to watch the Eagles [NFL playoff] game. It's the friendships that keep people motivated to run.